This manor house parador conserves the traditional architecture of this region and combines perfectly with the atmosphere of this lovely city. Comfortable rooms and pleasant surroundings help the visitor to sense an environment of peace and tranquillity. 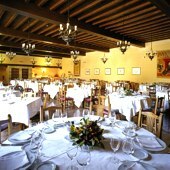 Sample the most traditional dishes of Cantabria. Recommended are the "cocido montanes" which is a dish of boiled white beans, vegetables, bacon and sausages. Also enjoy the grilled sirloin steak with Tresviso sauce, Cantabrian hake with green asparagus, "sorropotun", and "quesada" (kind of pudding). The town has a zoo and nearby you must explore the Altamira Caves which contain one of the most incredible examples of prehistoric paintings in the world. Some have nicknamed it as the "Sixtine Chapel" of Prehistory. Enjoy the festivals in Santillana. Held on January 5th there is the Three Wise Men Parade. Santa Juliana festivities are held on June 28th and on August 16th the Feast of San Roque. Explore the Cabarceno Natural Park and the route of the Cares river. Experience the impressive views of the ”Picos de Europa” (Peaks of Europe) mountains. In this environment you may go caving, bungee-jumping, hang gliding, climbing, microlight aircraft flying, and canoeing. The Parador of Santillana is approximately 122 kms from Bilbao and the famous Guggenheim museum, designed by the American architect Frank O. Gehry. 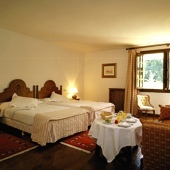 The Santillana Parador has twenty five twin bedded rooms, one double bedded room and 2 single bedrooms. In the rooms there are a telephone, satellite television, TV canal plus, safe and mini bar. 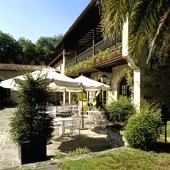 In the Parador Santillana there is sauna, heating, currency exchange, lift, free internet access in communal areas, garden, satellite television, gift shop, garage and parking facilities (without security and limited places) and conference facilities. Distance from the nearest airport to Santillana is approximately 23 kms, train station is 8 kms away and the nearest port is 25 kms away. Very nice, in centre of small town, lovely to walk out to find several places to eat. Big, clean, quiet room. Lovely reception staff. May 28th 2014 We enjoyed our stay, the reception was very good and the room was an excellent size, there was all that you could need in the bathroom to enjoy a lazy bath. The village was beautiful, hotel excellant, would stay there again. 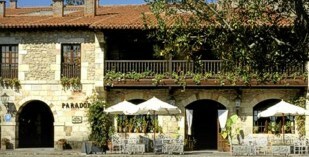 Parador hotel of Santillana is modern in the style of a Cantabria manor house.